I don't like door-to-door sales by anyone over four feet. Maybe it's because I'm from the west coast where we don't take kindly to random people stopping by to bother us, but out there, this just isn't done. Now I like the Midwest and how friendly we are, but does word have to get out? Because then they start busing people in to show me their fantastic personalities and ask me if I think they look sharp today. Are you serious? This is madness. I'd been pretty tolerant for a westerner until one guy. While my indoor cat was squirming and scratching his way towards an adventure in the wild, I calmly explained that I preferred to give money to organizations that fight child slavery, since that's the cause that's knocked me off my feet. He got a little lippy and walked away muttering in a personal and angry way. I locked the door and decided I wanted my No Soliciting sign back. Today I'm showing you how to make what I came up with. 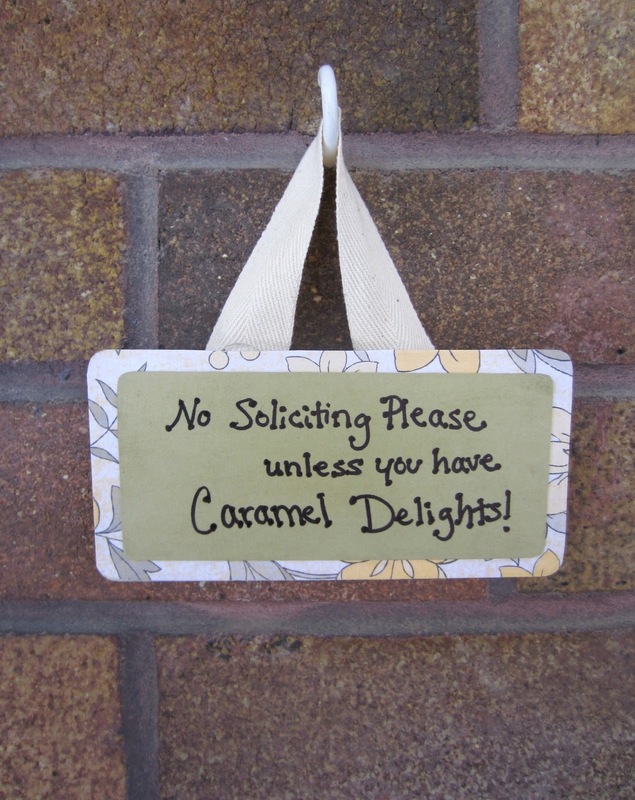 It's a cheery little version of a No Soliciting sign. You can add the witty, "Unless you have thin mints" caveat if you like. Either way, it says no thank-you for you, when you're trying to limit interruptions, are terrible at saying no, trying to watch your budget, or have sleepers. If we must say, "Bug off!" we might as well do it with polka dots! As far as scrap paper goes, you'll use a patterned paper for a pretty edge and a solid paper to write on. I got my little wooden plaque in a pack of several at Hobby Lobby. They also have oval, which works well too. Now all you have to do is wait until it's completely dry and write with a Sharpie. The scariest part! If you aren't a big fan of your handwriting or it has a split personality, looking good only when it wants to, use this trick I learned to make it more uniform. Put dots on all the ends. See? I recommend putting it near your door bell or directly on your door. Still, there are the obtuse few, who wake you from a dead nap, apologize and keep talking, only to get half-way through their shpeel and say, "Oh, I see you have a No Soliciting sign, I wouldn't have bothered you if I'd seen it, but..." and continued their shpeel! True story. But for the most part, you'll have more calm and less awkward saying no. Considered this before but never have gotten around to putting a sign up.